EPA Administrator Scott Pruitt used to brag about how much the US was reducing carbon emissions, even while he was denying climate change was a problem and the Paris Climate Change Accords were against the best interests of our country. One reason for our lower emissions is the less of our electricity on a percentage basis comes from dirtiest fossil fuels- coal. As shown in the above chart, US coal shipments from mines were 661 million short tons (mST). This is the lowest coal shipments since 1983 – wow 35 years! 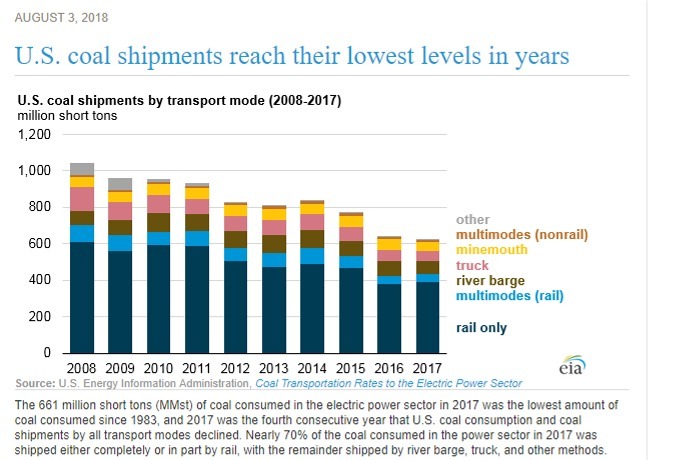 The above graph shows only coal shipped within the US. EIA also posted higher total production statistics which includes exports. For 2017, the preliminary estimate of total production is 774 mST, a slight improvement over 2016 production of 728 mST. This slight uptick is probably not going to last as preliminary first quarter production (Jan-Mar 2018) declined by 5.2% over the prior quarter. The trendline is either flat or down. See link below for these statistics. Donald Trump supposedly “digs coal.” But the electric utilities don’t because it is more expensive. They have been switching to natural gas during the last 20 years which includes the Bush and Obama administrations. Particularly hard hit were coal mines on the east cost. Note: this report was produced by the Energy Information Agency, a part of the Department of Energy, headed by former Texas governor Rick Perry. There was a short video on one of the cable stations, touting the success of Trump’s policies, as evidence by how many coal filled barges were going down the Mississippi river. Given how little coal is transported by river barges, one can see this was pure nonsense. Just partisan politics dressed up as a news story. Coal is used primarily to generate electricity. About 30% of our electricity comes from coal in 2016. It was 52% of our electricity in 1997. 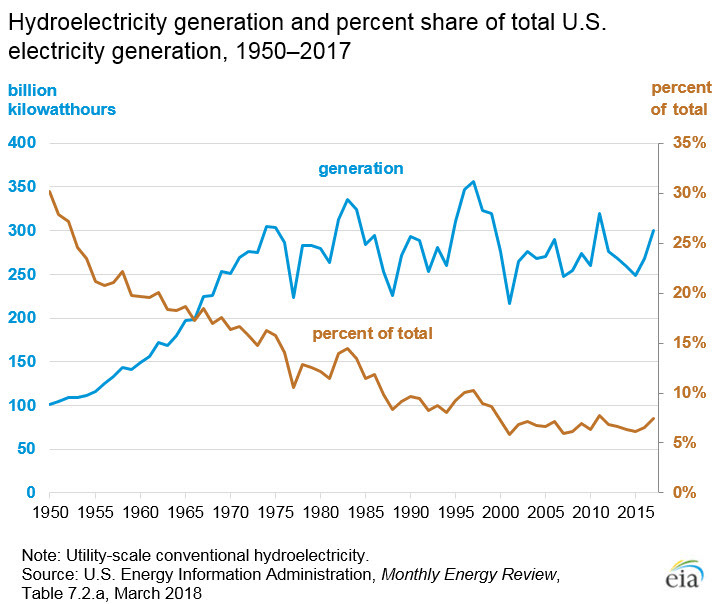 As shown in the graph below, in the last 66 years, the percentage of electricity generated by coal has never been this low. Natural gas began its rise around 1989 with 10% share and never looked back. Nonhydro renewables, primarily solar and wind have increased since 2005. Going from 2% to 8% with alternatives is a 4 fold increase. According to the EIA, wind turbines account for 6% of US electricity generation, leaving only 2% for solar. I believe the graph below does not include electricity from residential solar panels. The graph seems to show declining use of hydroelectric power, but this is really the effect of the increase in electrical demand being satisfied by other fuels, as shown below. If the period from 1975 to 2015 is examined, it shows that hydroelectric supplies between 250 to 350 bKW, with a flat trendline. For renewable fuels, solar and wind turbines are the big growth areas now and in the future. Non-renewables account for 84% of the US electricity. The general trend of increasing renewables can be seen in many countries. For instance, Germany fossil fuels and nuclear for electricity account for 70%, with coal percentage in decline and natural gas percentage on the increase. One of the first actions of newly elected Donald Trump, with the help of Congress was to repeal the Stream Protection Rule, which was a detailed clarification of prior rules for the dumping of debris from new mines into streams. Hundreds of miles of streams and rivers are lost. Environmentalists at the time did not think the rule went far enough. Coal mining in four states (Kentucky, Tennessee, Virginia and West Virginia) dynamite the top of the mountain (called mountain top removal, or MTR), and the “spoils” or tailings are dumped into river valleys. The destruction of the environment is pretty terrible, and includes land, water and air pollution. Coal mining is a messy business. 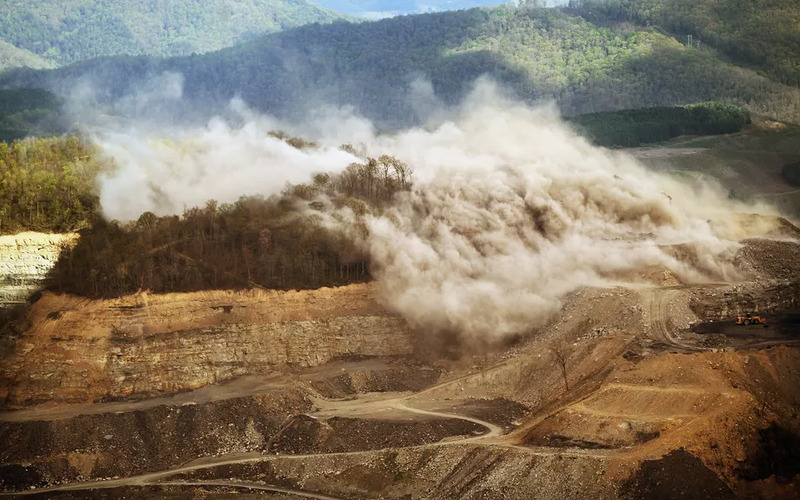 In parts of West Virginia, Kentucky, and Virginia, mining companies often get at underground coal seams by blowing up the tops of mountains — a process known as mountaintop removal mining. Once that’s done, they’ll dump the debris into the valleys below, which can contaminate streams and waterways with toxic heavy metals. Appalachian Voices, an environmental group, estimates that coal companies have buried over 2,000 miles of streams in the region through mountaintop removal mining since the 1990s. And there’s growing evidence that when mining debris and waste gets into water supplies, the toxic metals can have dire health impacts for the people and mostly rural communities living nearby. Scrapping the stream protection rule might help boost the bottom lines of some mining companies at the margins, but it’s unlikely to reverse the long inexorable downward trend of mining jobs in Appalachia. Robert Murray’s political philosophy seems anchored on the conviction that global warming is non-existent, and the only reason for the decline in coal production is unnecessary government regulation at all levels. At the very top of the Murray action plan, is the Clean Power Rule, one of the achievements of the Obama administration, which Murray has claimed is illegal. The basis for this contention was that the rule was not approved by Congress, and President Obama was overstepping his authority. In 2016, the Supreme Court halted enforcement of the regulation, pending resolution in the courts. The EPA under President Obama conducted numerous studies, showing that the primary benefactors of the Plan, were low income or coal miners, who lived close to coal fueled power plants. Opponents of the Plan claimed that this would raise unemployment in coal mining states and cause power plants to shut down. There are difference of opinions on the economic impact of the plan. President Trump is strongly opposed to the Clean Power Plan. The proposed 2018 budget does not include any funds for enforcement of the Clean Power Plan. It can not easily be repealed without avoid court challenges by supporters. At present, the acting administrator of the EPA is Andrew Wheeler, who is a former lobbyist for the coal industry. On June 20, 2018, it was revealed that prior to Wheeler’s appointment at EPA, he worked with Robert Murray and other coal companies, seeking repealing of Obama administration policies. The documents also show the role played by now-EPA Deputy Administrator Andrew Wheeler, who then worked as Murray’s lobbyist, in setting up the meeting, where the coal boss presented Perry with a four-page action plan for repealing environmental regulations viewed as burdensome for the coal industry. During his confirmation hearing for the EPA post, Wheeler told senators that he had briefly seen the document and acknowledged taking part in the meeting. The article really nailed it, as stating that killing the stream production act was unlikely to reverse the decline in the coal industry. But Trump owed a favor to Robert Murray.